Falmouth bay could be used as a testing ground for wave energy machines. 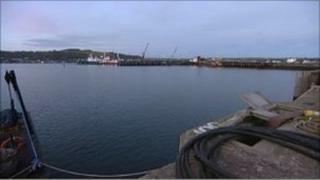 The harbour commissioners (FHC) want to allow developers to test wave energy devices in calm waters with easy access to the shore. Machines could then be linked to the National Grid via the Wave Hub, a "socket" for wave energy machines on the seabed off the coast of Hayle. Wave Hub has welcomed the "exciting" project, called FabTest. David Ellis, chairman of FHC, said: "FabTest will give developers the chance to test their devices in a less extreme environment, and will not involve costly deployment offshore. "They will be able to test components, system concepts or full-scale devices before progressing to Wave Hub." Wave Hub general manager Guy Lavender said: "FabTest is what the industry is telling us it needs on that critical path towards the commercialisation of wave energy. "It's a very exciting project designed to complement Wave Hub and would be a real string to our bow when it comes to what we can offer marine energy companies."